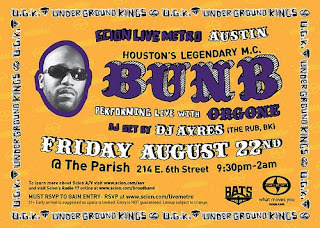 From the 102 degrees hot department.. Bun B @ The Parish on Aug 22nd! Performing live with Orgone and DJ Ayres. It's been a minute since the Scion shows come thru, must be the recession. Bernard Freeman, better known by his stage name Bun B, is a rapper and one half (with the late Pimp C) of Southern hip hop act UGK from Port Arthur, Texas. He is a member of Rap-A-Lot Records, an underground hip hop record label. UGK has released several studio albums and have been featured on numerous other rappers' tracks and singles. Before and after Pimp C's death, Bun B has found success in his solo career as well as in UGK. Based in Port Arthur, Texas, Bun B and fellow rapper Chad "Pimp C" Butler formed UGK in the late 1980s and in 1992 signed with Jive Records, which released their major-label debut Too Hard to Swallow. That album was the first among several more bestselling Southern rap albums. Although focusing on UGK, Bun B formed the side project Mddl Fngz in 2000. Mddl Fngz was featured in the AND 1 Streetball video game with the track "Hard In the Paint". UGK has performed guest appearances in the songs "Big Pimpin'" by Jay-Z and "Sippin' on Some Syrup" by Three 6 Mafia.